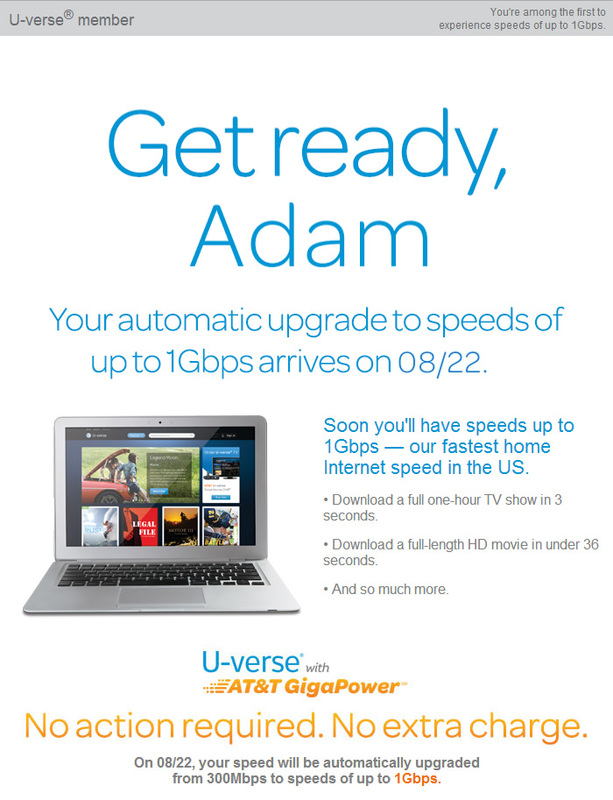 Looks like AT&T(s t) so far is beating Google(s goog) to the fiber-to-the-home punch as the telecommunications company is beginning the upgrade to true gigabit speeds to its existing Austin, Texas, Gigapower customers. The upgrades will take place over the next few weeks, and customers won’t have to do anything in order to get them. If you have the service, drop me a line when you see your speed boost, because I’m curious what areas will get it first. If you are curious about AT&T’s equipment and other upgrades associated with delivering this service, check out our story here. AT&T announced that it planned to deliver FTTH service to certain parts of Austin on the same day Google named Austin, Texas as the second city to get its gigabit service. The Google service was planned to begin operations in the middle of 2014, but other than Google’s permits and some construction, there’s so far been no sign up period or big announcements about the pricing and geographic locations of the Google Fiber service. However, since we’ve documented that AT&T’s Gigapower service involves paying a hefty price to keep Ma Bell from snooping on your web history in order to serve you ads, I know a lot of locals are interested in Google’s plans. As part of the upgrade from AT&T, the company has created an interactive TV app called Austin Found, that offers Austin U-verse TV customers personalized information on Austin food, entertainment, sports and the arts. It reminds me a bit of the dedicated news channel that AT&T rival Time Warner Cable(s twc) offers in Austin — only without the dedicated news team. And as an extra incentive if Austin residents have an existing AT&T wireless account and want to add Gigapower. They get a $100 promotion credit off their bill through Nov. 8. The deal works, too, if you have Gigapower and want to add AT&T wireless service. I pay the full price for no-ads and I love the server at 300/300. Just got my gigabit notification in NNE Austin. Ads?? I’ve web matured enough to the point where I actually don’t even see the ads. If one pops in my face, I promptly close it without even looking at anything but the “x”. They may be all over the place but I honestly could not tell you the last time an ad prompted me to go shop.